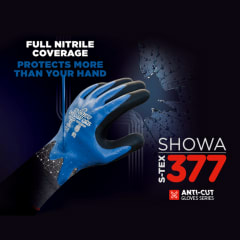 Following the success of the ¾ nitrile-coated S-TEX 376 glove, SHOWA proudly launches the fully-coated S-TEX 377 version as a new addition to their premium cut-resistant S-TEX range. Utilizing a double nitrile coating of film and foam nitrile, with extra foamed nitrile finish on the palm plus the patented Hagane Coil® fibres, the S-TEX 377 is another impressive product: EN 388: 2016 Cut Level 4/D, liquid resistant, strong grip under wet and light-oily conditions, ergonomic shape and thumb dexterity. It’s the perfect addition to the family, complementing its twin brother, S-TEX 376, with all the same benefits and features. The difference being the nitrile coating that extends onto the wrist for more liquid penetration protection. The S-TEX 377 protects the hand from oils, hydrocarbons, grease and abrasions, with long-lasting grip performance under wet and oily conditions. The foam nitrile on the palm absorbs grease, then seals it in. Instead of becoming slippery, the air bubbles start to create a suction effect when the user applies pressure by grabbing onto something. At the same time, the blue nitrile film layer repels water and oil off the back of the hand, making it a perfect glove for construction, manufacturing, metallurgy, logistics, glass and automotive industries. The table below indicates how our coating provides superior grip in dry and oily environments. Unlike competitive products, the back side of the thumb has just a coated nitrile film layer which allows the thumb to move freely. This freedom of movement, combined with the ergonomic shape of SHOWA’s patented hand former greatly reduces hand fatigue with fit and flexibility. With Hagane Coil® technology we can provide high levels of cut resistance without sacrificing comfort. Hagane Coil® utilizes a unique coiling technique that binds an attending yarn to a stainless steel core. The integrated steel core provides better protection than any natural or synthetic fibers, yet it is thin enough to allow flexibility and free movement as the hand bends and flexes. By utilizing different composite yarns, we can create a different wearing experience. Soft yarns and stainless steel combinations offer more comfort and dexterity, while hard yarns and stainless steel offer superior protection and durability. It is a combination that offers maximum protection, comfort and performance.